Archive for Child Agriculture Safety. Farm Tractors Are Not Theme Park Toys! When we go to amusement parks, we expect to be scared out of our minds as we screw up our courage to ride on the roller coasters. The blood curdling screams stick with us long after we return with our little ones to the safety of the family farm. However, those very children are statistically more likely to be killed on the farm than at the amusement park. The worst part of this statistic is that we seem to be oblivious to the very real danger presented by the equipment we have driven and shared rides on for generations. Farm machinery and particularly tractors fascinate children. They are giant replicas of the little toy ones they play with every day on the living room carpet. The desire to imitate Mom and Dad means that at very early ages children learn to drive tractors. Until that day the lure of being where the tractor action is can be lethal. When you factor in the number of large pieces of equipment moving around the farm during busy seasons their small but precious bodies are not only hard to see but too often in the wrong place at the wrong time. We wouldn`t think about not buckling children into seatbelts in the car. We insist that they wear helmets when they ride bikes or protective padding for sports. We have childproof medicine caps, safety gates and bed rails but, when it comes to tractors, we let tradition and those old memories of bouncing through the fields in the cab of the tractor with grandpa impair our judgement. We need to decide whether we want to preserve unsafe memories or our children. The month of March is popular for week-long Ag safety observances by several national organizations. One of those is the “Keep Kids Away from Tractors,” campaign. This is the unified message of the Childhood Agricultural Safety Network (CASN) which is a coalition of 38 health, safety and youth organizations in the U.S. and Canada. The coalition’s campaign urges adults to think twice before allowing children 12 and under to operate tractors or ride on them. 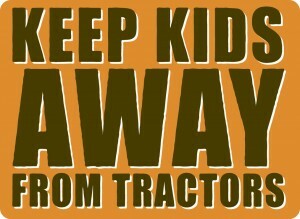 The “Keep Kids Away from Tractors” will be featured in a webinar at noon (CT), Wednesday, March 12. Presenting on behalf of the National Children’s Center for Rural and Agricultural Health and Safety will be Director Barbara Lee, Ph.D., and Marsha Salzwedel, M.S. The webinar is sponsored by the Childhood Agricultural Safety Network and AgriSafe Network. Register at http://www.agrisafe.org. The coalition urges individuals and groups to incorporate CASN resources in their safety initiatives. 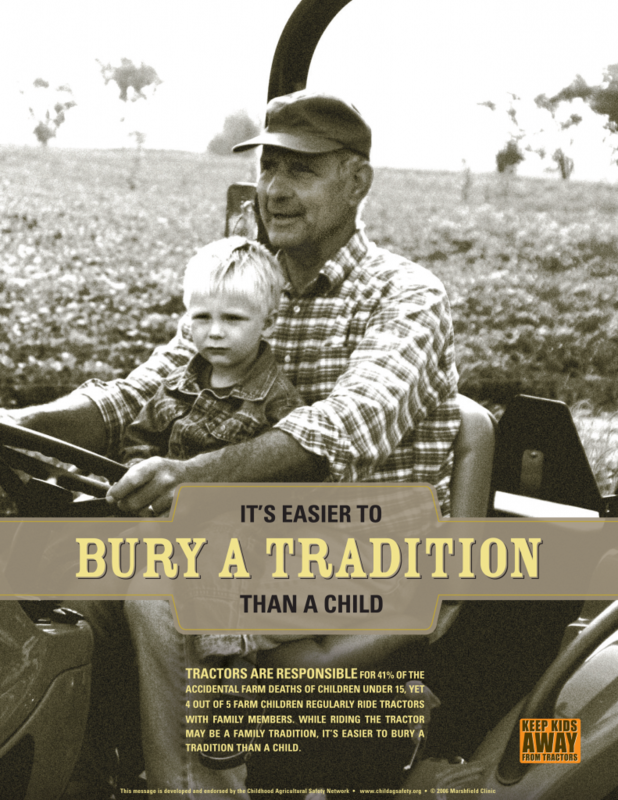 Posters, radio ads and more information can be found at http://www.childagsafety.org/TractorCampaign.htm. A 1-year-old North Dakota boy died after falling from a tractor driven by his father. His 4-year-old brother survived. A 6-year-old Minnesota boy died with his grandfather when the tractor they were riding rolled over. A 5-year-old Kansas girl died when she fell through the windshield of a combine driven by her father. The biggest tragedy of all? These deaths were 100 percent preventable. Before we teach them to drive, let’s teach them to be safe. As much as rural kids like the exceptional skills that being farm born and raised gives them compared to their town friends, they need to also learn the unique farm safety rules that can save their own (or their visiting friends) lives. Everyone — driving or on foot – near farm equipment needs a healthy respect for how easy it is to miss a little head running by when the focus is on moving feed, harvesting or hooking up to another piece of equipment. Of course, all of this assumes that the adults working on the farm are alert to the dangers and accept their responsibility for child safety. There is no shame in being over-protective. A little healthy fear of tractor danger is healthy for everyone. The goal isn’t to be fearless. The goal is to be safe. A child dies from injuries on a farm an average of once every 3.5 days. The most common situation involves a tractor. When kids and tractors get together the outcome can be tragic. CAIR (Canadian Agricultural Injury Reporting) reports that at least 45 per cent of accidents on farms occurred close to the farmhouse, such as in the farmyard, driveway, barn or shed. About 63 per cent were machine related, including runovers, rollovers and entanglements, mostly involving tractors (47 per cent). Discuss tractor designs with your child. While some newer tractors have cabs and roll-over bars for added protection from accidents, tractors continue to be inherently unsafe for drivers and riders because of the risk of roll-over accidents. Talk about seat belts with your child. In a car, everyone has a place to sit and a seat belt to provide a safety restraint. Most tractors have only one seat and one seat belt to keep the driver safe, meaning that tractors are safe for only one person driving or riding on it, advises the North Dakota Farm Bureau. Kids know about looking both ways when on the street. They need to respect the “street smart” rules of farm lanes, barnyards and fields. The right of way always goes to the equipment. Caution your child to never accept a ride on a tractor, warns the KidsHealth website. Riding anywhere on a tractor but in the seat with a seat belt is unsafe, including on a fender or on an attachment. A tractor can flip over in as little as 1 1/2 seconds, according to the North Dakota Farm Bureau. Tractors can also hit bumps or uneven surfaces and someone not secured with a seat belt could fall off the tractor. Warn your child about the threat of being run over by a tractor. Falling off the tractor could lead to being run over by the vehicle. 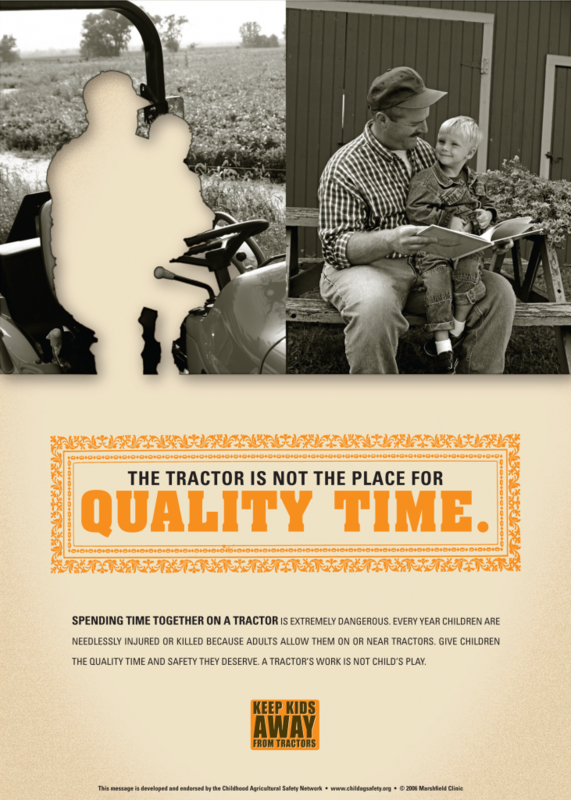 In addition, it can be difficult for a tractor driver to see people near a moving tractor — especially children. Teach your child to stay away from work areas and moving tractors because she might not be able to make her presence known to the driver. The slogans are hard hitting. They are not meant to make us feel comfortable and reassure us that, of course, our children’s safety comes first. If discomfort makes us take responsible action, then the discomfort is well worth it. As much as we want our children to grow up in the traditional farming lifestyle that we cherish the key is that they “grow up”. Farm safety isn`t about instilling fear. It`s about being safe not sorry. Nothing can heal the heartbreak of losing a child to a preventable accident. Please like and share this post to help spread this valuable message.